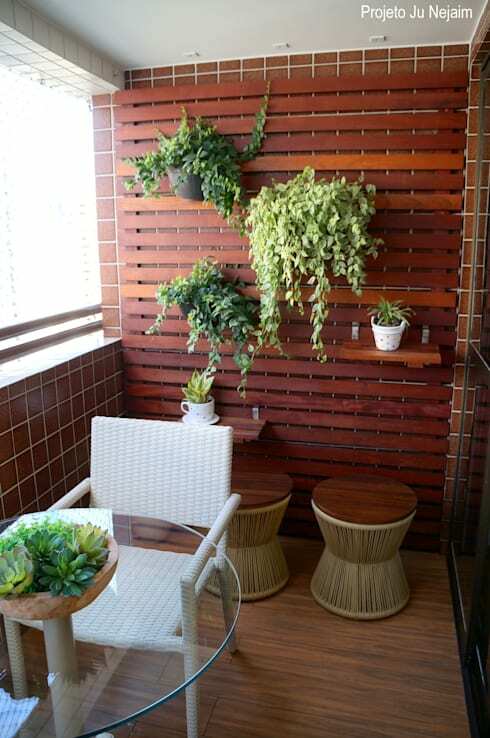 How can I create and plant a vertical garden? Vertical gardens are the trendiest, funkiest and most fashionable way to decorate a space, adding natural beauty and oxygen to your home! Today we at homify are going to show you how you can create and plant a vertical garden, in a variety of different ways. There are so many options available, depending on the layout of your home and the type of wall that you are going to be using. Not only will a vertical wall breathe new life into your home, but it will also be a fun project for the whole family to get involved in. One of the easiest ways to make a vertical garden is to recycle your old pockets. Yes, you read correctly, your old pockets! When you're ready to throw out that old pair of jeans, cut the pocket out. Once you have four, six, eight or even more pockets you can get to work! Sew them all onto one piece of fabric and hang it on your wall. The pockets need to be fairly deep and wide, allowing you enough space to create your garden. Head to your local nursery and opt for plants that aren't going to grow too large. Plant them in each pocket, give them a little bit of water and there you have it! The material of the pocket will also keep the plants moist. The great thing about this is you can put a different colour or type of plant in each pocket, creating a beautiful collage when it comes to your vertical garden. You may have a stand-alone wall that you want to decorate, but don't to overload it, especially if it is an interior wall. Interior vertical gardens need to look neat and manicured at all times. One way to achieve this is to fix a piece of mesh to the wall, at the exact size that you want your vertical garden to be. This way, you grow as many different types of plants that you want on the mesh, but it will stay neat and confined to this structure. You want your stand-alone wall to look professional and well-managed, like in this design by Sundar Italia. Another great way to utilize your stand-alone wall is to hang little pot plants across it. This way you can arrange them in a neat pattern. They will also be easy to manage! You can even opt for colourful pots that are mixed and matched. It's time for you to do something a bit more interesting and creative with granny's dresser that you've had since you moved out of your parents' home. 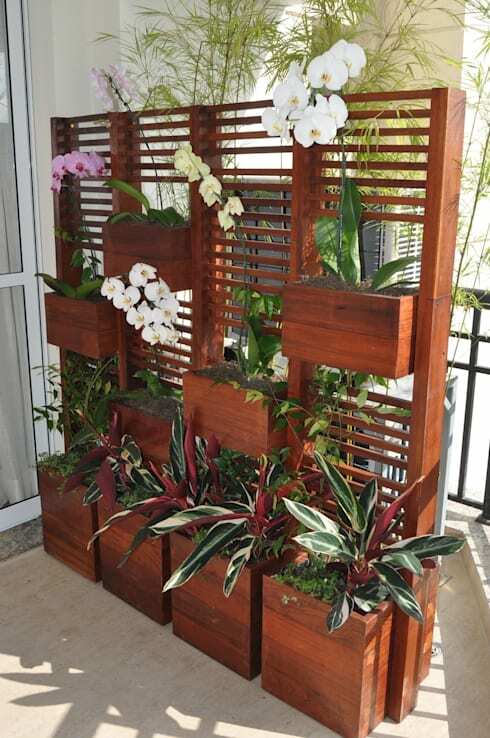 Use the drawers to create a fabulous vertical garden, like this one in the photograph. How modern and sophisticated does this look? Take all of the drawers out of the dresser. You may need to give them a fresh coat of paint so that it looks uniform, neat and trendy. You can opt for neutral colours or bright colours, depending on your decor scheme and personal taste. If you like a natural wood look, you can leave the drawers as is. The easiest way to use drawers is to fix them to the wall, which will create gorgeous flower bed containers. Easy, right? You can also find a great stand, like the one in the photograph, which will prop the drawers up, tilting them towards the sunshine. If you don't want to damage your wall by fixing large drawers, pots or slabs of mesh to it, you can always go for hanging planters. These can still rest against the wall, but the plant pots or vases will hang from the ceiling. The great thing about this is that you can opt for any shape, colour or type of pot plant or vase. You can also choose colourful string to hang it from the ceiling with. Adjust them at different heights so that they can create a wonderful, eclectic look and feel. Also have a look through the homify plants and flowers products for inspiration. In an eco-friendly world, recycling is a must. You'll see in this design, by Celina Molinari Architects and Interiors, a regular pallet can be recycled and used for a vertical garden. Not only does this keep your wall clean and the paint protected, but it also looks really unique. It adds texture and character to the wall, as well as depth. Once your paint pallet is up, fix a few pot plants onto it. 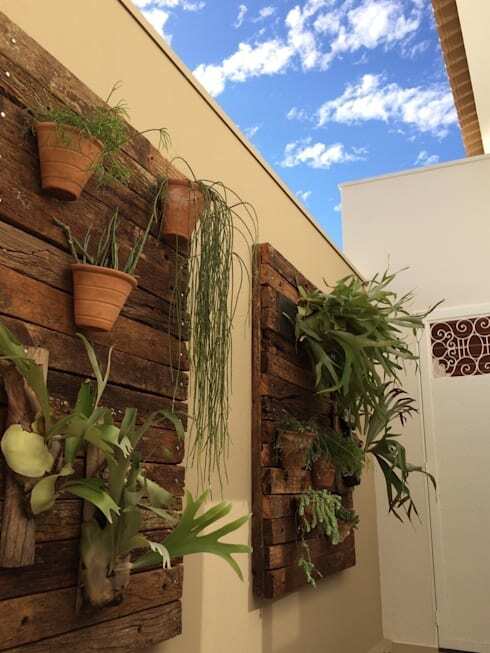 Your vertical garden is complete, breathing new life into the exterior of the home. Just like recycling an old pallet, you can also go for boxes or crates. These form wonderful, deep flower beds and also look really cool too. You can repaint them, depending on your tastes. You can also use crates in a variety of different designs. Hang them in a row, sporadically or in an alternative pattern. The plants and flowers will spill over the top, creating a rich, earthy effect. 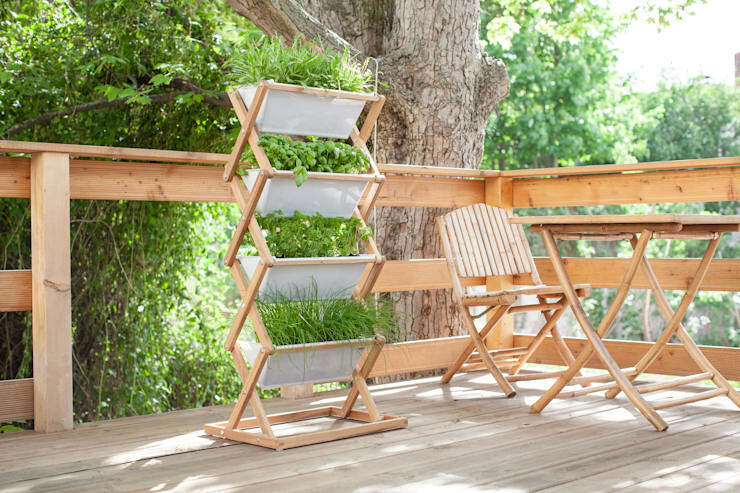 Have a look through the homify garden accessories for extra ideas to spruce up your garden. Green is a theme here! 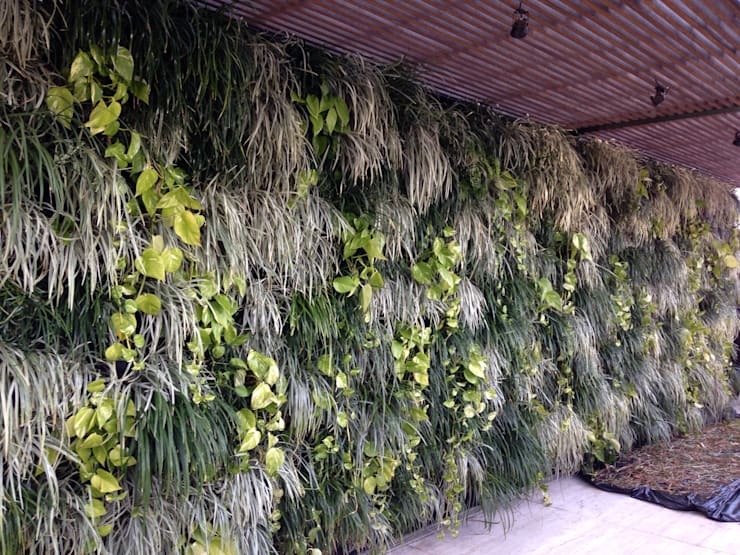 Creating a vertical garden ultimately means taking up less space on the ground. It also means a more natural form of decor. 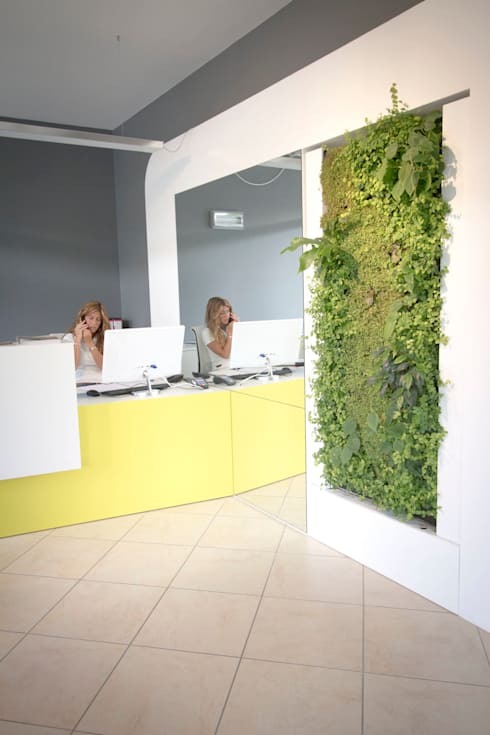 For those who love nature, a vertical garden is a great opportunity to do your part for the environment. Recycle all of your old bottles and use them as vases for your vertical garden. Paint them in one, standard natural colour and you have the perfect tool for displaying your favourite buds. Also read these tips on having your own holiday garden. 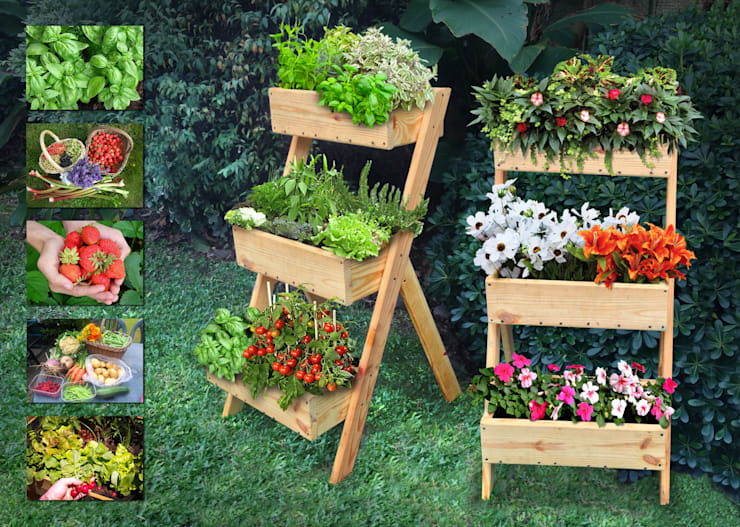 A ladder is the next best thing when it comes to designing a vertical garden, because you don't need a wall to do it! Protect your walls and create your very own vertical space with a ladder, whether it's wooden or steel. Use each step as a platform for your favourite pot plants, or you can even put your recycled crates or bottles on each step. The best part about a ladder garden is that you can place it inside or outside and in any room. 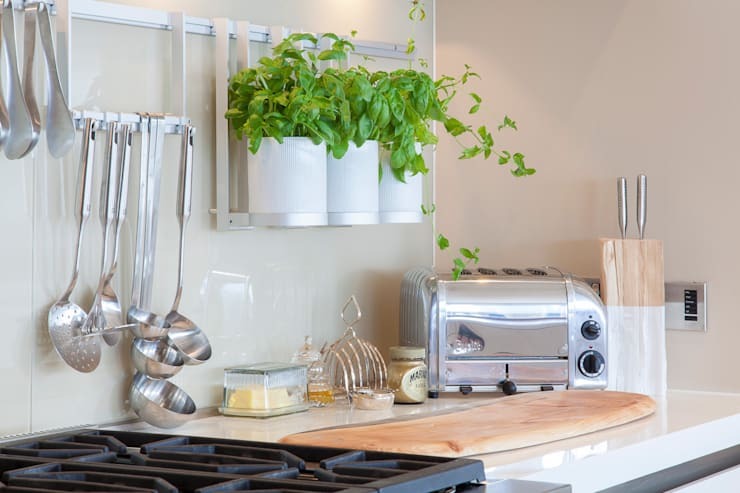 It's the perfect decor tool for the kitchen, the bathroom, the living room or even the bedroom! 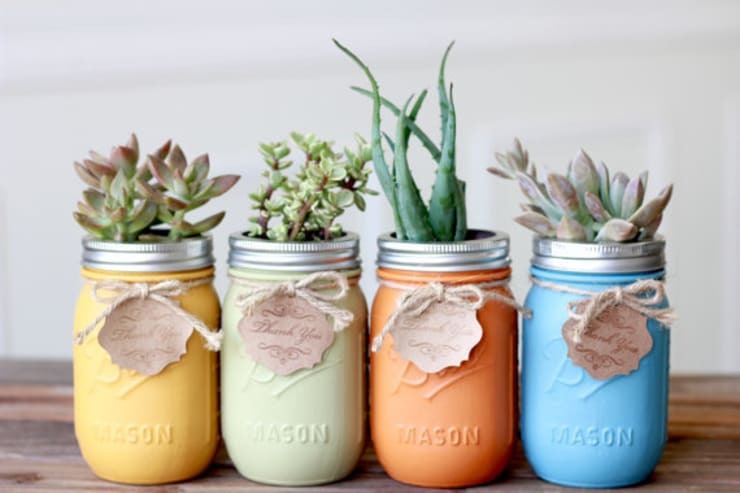 We end off our article looking at the mason jar planter. Just like all of the other recycled objects that we've looked at, the mason jar is a practical, functional and green object to use for a vertical garden. They're also quite light and small in size, which means you can use as many as you like! In this image, you'll can see that the designers have chosen to paint the mason jars gorgeous, soft, pastel colours. This enhances the beauty of the natural plants. There are so many ways to create a vertical garden! What are you waiting for? Is your green-thumb twitching? These are eye-catching garden ideas you should consider. What do you love about your vertical garden? Do you think they're a good idea? Let us know!